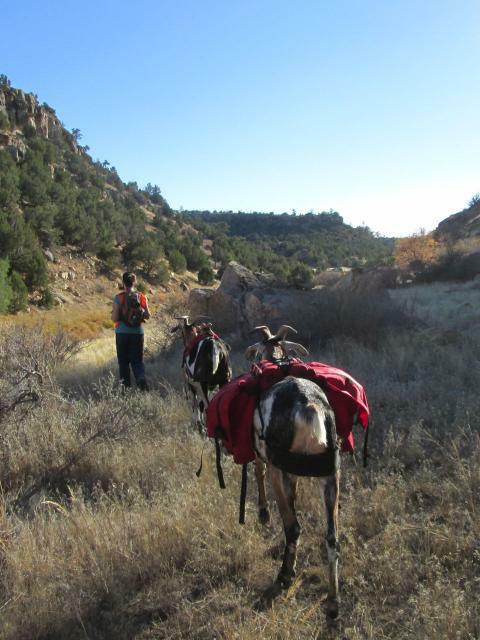 Yesterday, Phil and I with our friend Tiffany set out for and afternoon hike in Cucharas Canyon. Phil and I first took this hike with PuebloPacker in 2014. 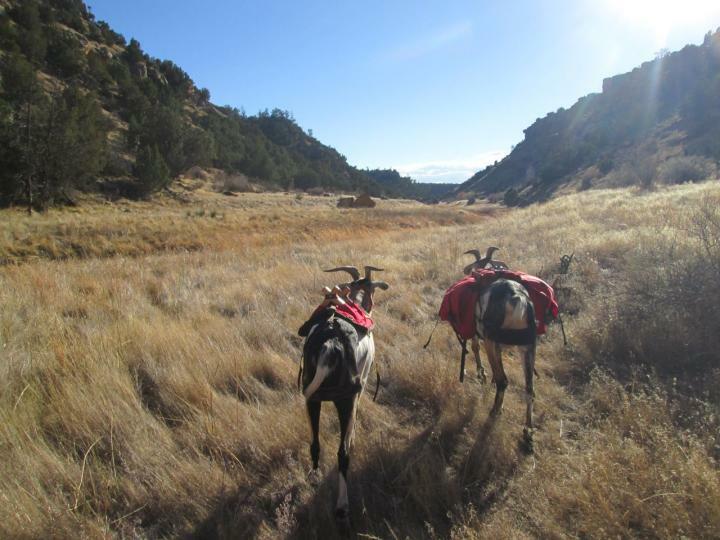 We called it “Sheep Canyon”, but it’s really the “Sheep Crossing” access to Cucharas Canyon. 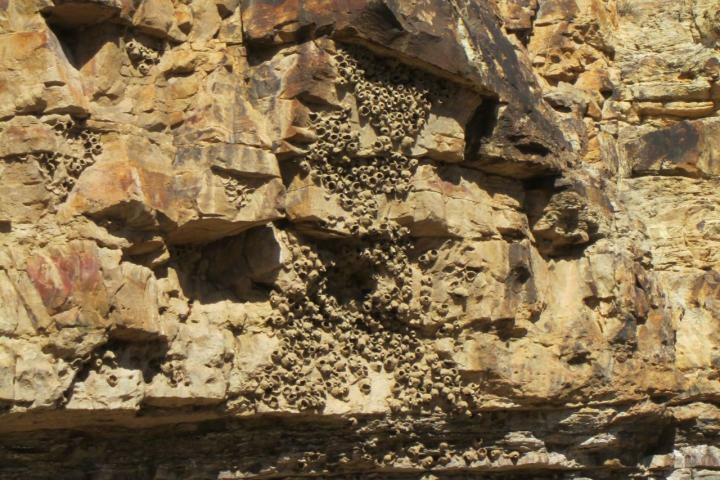 The first thing we saw when we entered the canyon was a wall filled with swallows’ nests. This was only one small area. Finn and Sputnik came with us and Sputnik got to carry the snacks, water, and warm layers (which we turned out not to need, but it’s wise to be prepared this time of year). Finn carried an empty saddle so the red pocket pad would show him up well in case of hunters. 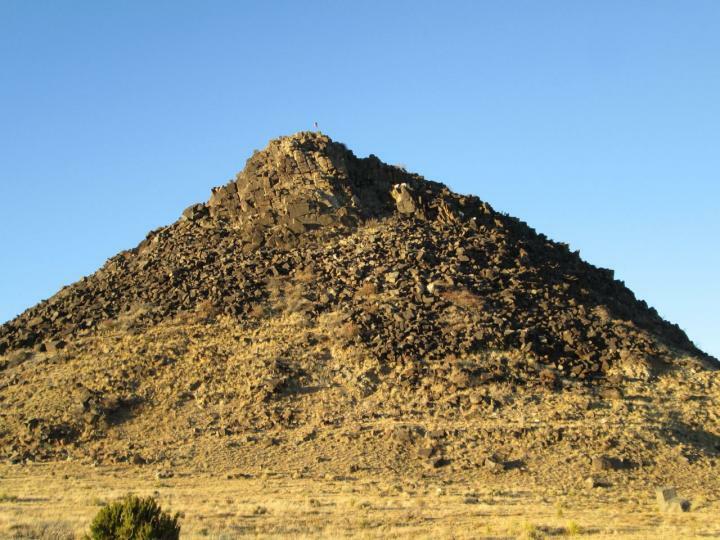 On our way home, we paused to look at the Huerfano Butte, a small, isolated, and long-dead volcano whose Spanish name means “orphan”. 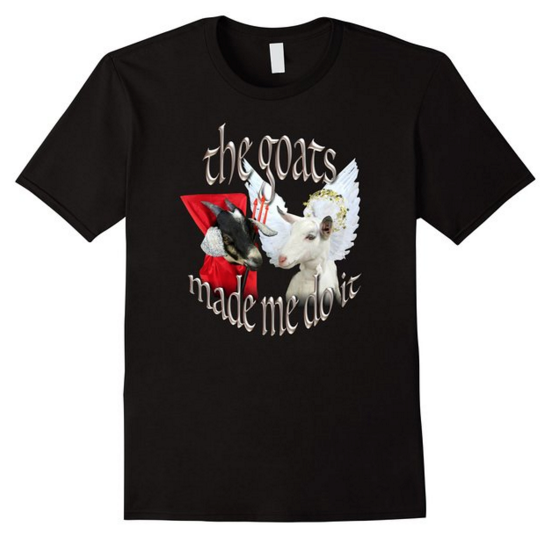 Much to our surprise and delight, it had GOATS on it! 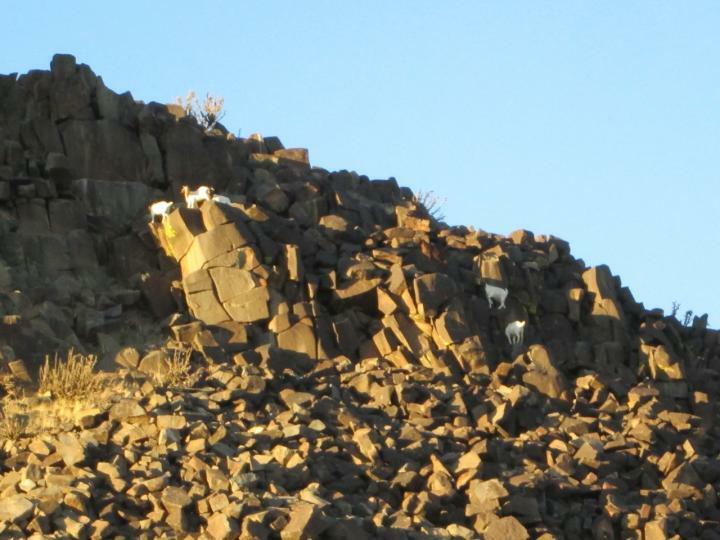 A small herd of six or seven Boers was happily clambering along the precarious rock ledges near the top. 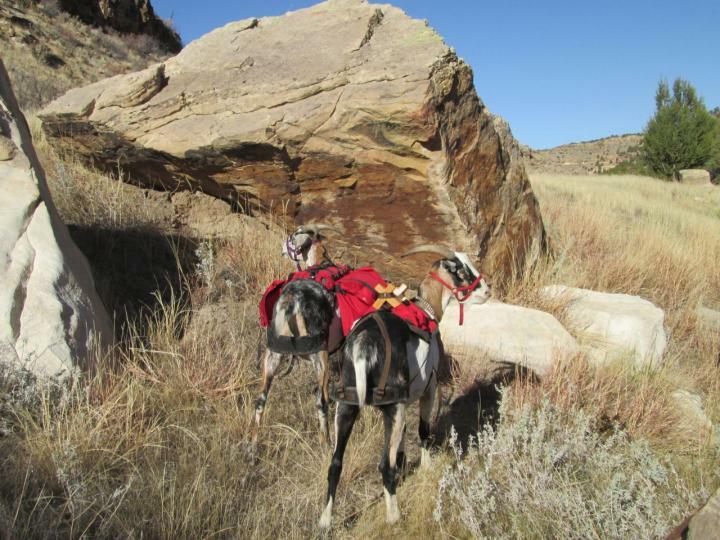 Phil and I have always felt that rock outcroppings such as this should rightfully be populated by goats, so you can imagine how thrilled we were to see this little crew. 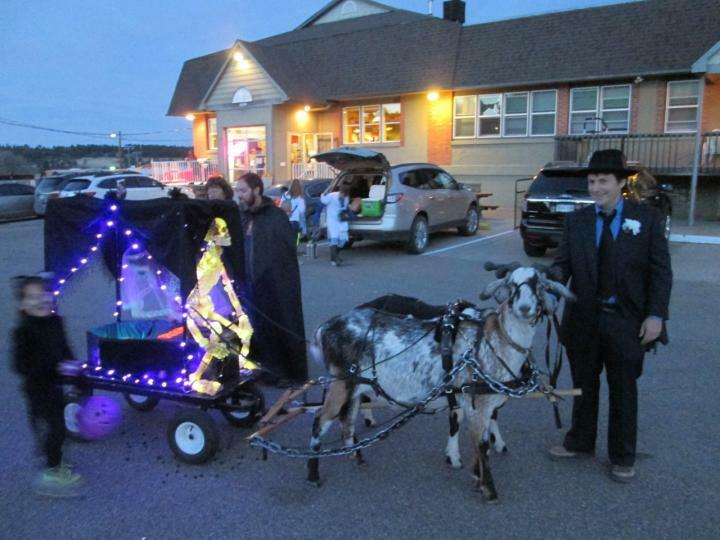 Rye had its annual “Halloween Town” celebration last night and we at Goat-O-Rama did not shirk our duty! 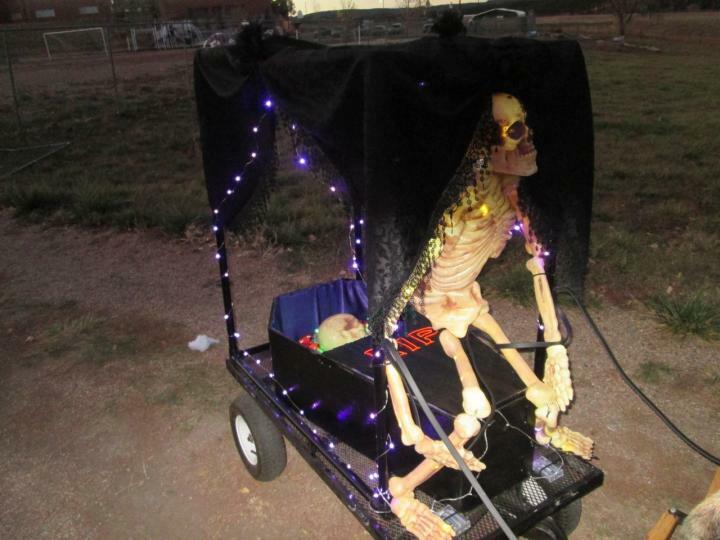 Phil and I spent the last week planning, wiring, lighting, sewing, painting, and fabricating to turn our little goat wagon into a haunted hearse complete with glowing skeletons. 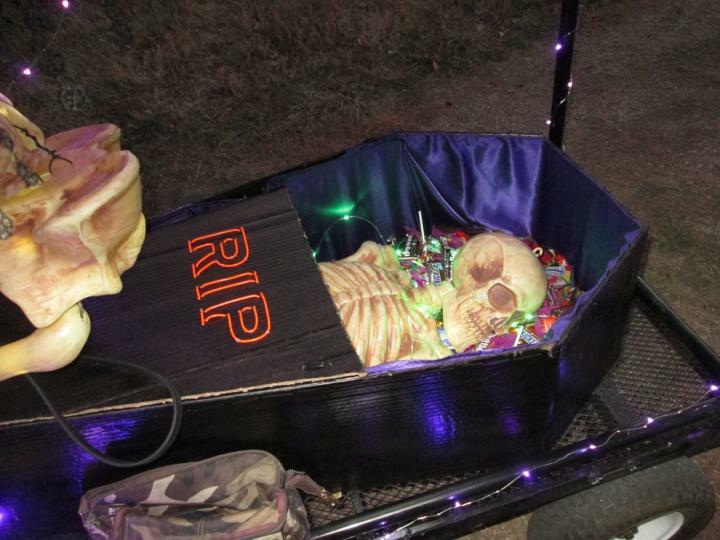 It turned out even better than I’d hoped, and several kids were afraid to reach their trembling hands into that green-glowing coffin and take their trick-or-treat candy! 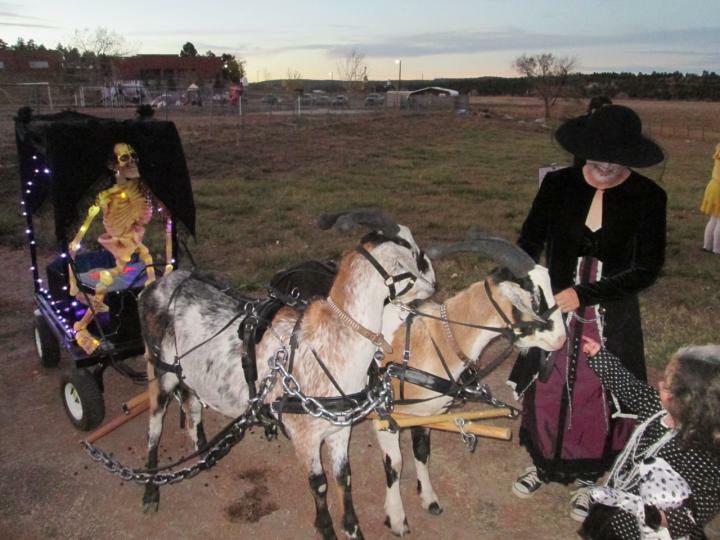 A lot of the kids couldn’t have cared less about the candy–they just wanted to pet the goats! I was a funeral home director’s wife or something. I wore my steampunk dress and an old-fashioned veiled hat. I painted my face into a sort of skull. I did not, however, wear my shiny spike-heeled witch’s boots! I decided that comfort trumps fashion and wore my black and white sneakers with striped stockings. Phil took wire and white christmas lights and threaded them all through our skeleton driver so he would “glow in the dark”. He gave off a very spooky, ghoulish glow. Phil placed eerie green lights inside the coffin for a nice zombie effect. Phil dressed as a funeral home director. I love the big fake chains we attached to our traces. Of course, it’s always hard to get good pictures of these things. When it’s bright enough to see the carriage, it’s too bright to see the lights; and when it’s dark enough to see the lights, you can’t see much else. Our driver shows up very nicely here, but nothing else does. 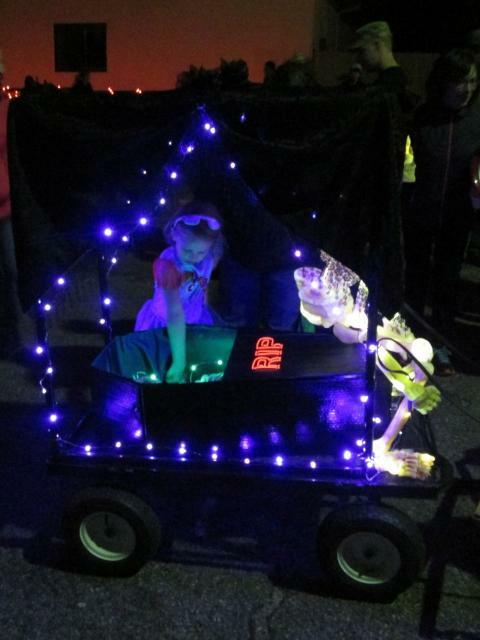 I love this trick-or-treater bathed in the purple glow of the hearse lights. Finn and Sputnik were very well behaved for such a scary event. I took charge of the goats while Phil manned the candy station. The first thing that happened was about four kids ran up to Sputnik and all tried to hug him at once. He did not care for it and was jumpy when we got going again. 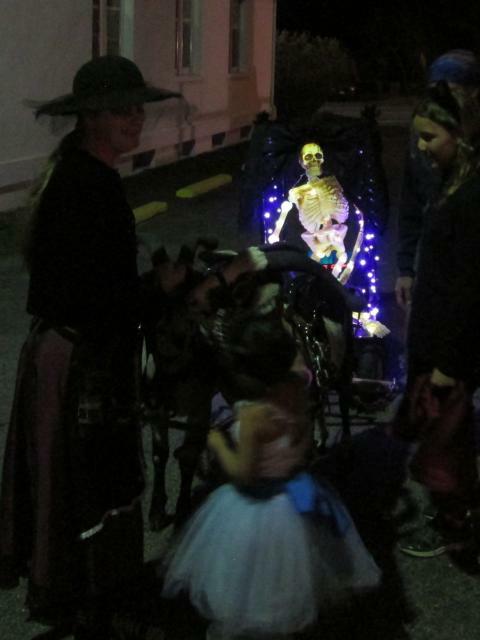 As we made our way up Main Street through the noisy, flashing, masked, and crazy-looking crowd Sputnik got more and more unsettled to the point where he wouldn’t stand still when we tried to stop and pass out candy. He was causing the hearse to jolt suddenly forward and back which was not at all safe, so we had to get him out of there and take a breather. We took the boys to a dark, quiet side street where we walked and trotted just once up and back. By the time we got onto Main Street again, Sputnik had recovered and was ready to face the excitement. He was calm and well-behaved for the rest of the evening. Finn, as always, was a huge sponge for every bit of attention thrown at him and never objected to standing still for long stretches while kids hugged him, fawned over him, and even kissed him. One little girl insisted on giving Finn some of her candy and tried to feed him a lollipop. Her mother and I grabbed it away just in time. So of course she ran back to her candy bucket and picked out another one. She was so determined to share her candy with the goats that I finally told her to go back and pick out a Tootsie Roll because at least those don’t have sticks. Her mother also made sure this candy was unwrapped before letting her daughter feed it to the goats. Finn loved the candy but Sputnik preferred to stick with animal crackers. It’s amazing how observant the goats are even in a distracting, crowded, dark place. At one point Phil left his post behind the hearse and ran across the road to buy us some hot dogs. I didn’t realize the goats had been paying him any attention back there. After all, they could probably barely see him! But as soon as Phil trotted off, both boys whipped their heads around and Sputnik started baa-aa-ing. They were calm and good, but they kept their eyes glued to Phil the whole time and were relieved when he returned.